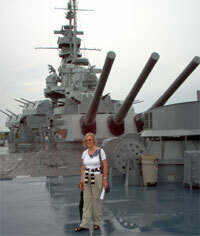 60 years after the end of World War II, a visitor from Germany tours "America’s battleship," as the U.S.S. Alabama is called on billboards in Mobile and along the highways leading to Mobile. Like me, my friend Brigitte was born after World War II. We have known her and her husband Gotthard for more than 30 years, and this is Brigitte’s fourth visit to the United States. The battleship U.S.S. Alabama did service in the North Atlantic during the war before being transferred to the Pacific sector. For Brigitte and her son Sören, touring the ship was quite an experience, including viewing the displays of fleet movements and the use of aircraft carriers in the Pacific theatre of the war. Aerial bombardment reminded Brigitte of some family history. In February 1945, Brigitte’s mother fled from Frankfurt on the Oder River (which is now a border city on the German-Polish border east of Berlin) to get away from the advancing Soviet Red Army. Judging by the reports on the advance of the American armed forces, she went south to a city which had been spared the devastating bombings that cities like Hamburg and Berlin had endured. She arrived at her goal during the night of February 12-13, 1945. Her goal was Dresden, and her timing could not have been worse. Allied forces firebombed Dresden that night and the next, killing thousands of civilians including many refugees who had fled from their homes in eastern Germany. Brigitte remembers her mom talking about bodies piled up in stacks the next morning on Dresden’s streets, and to this day she doesn’t watch television documentaries dealing with the firebombing of Dresden. In one area of the U.S.S. Alabama there is a roster of all the men who served on the battleship during World War II. Several thousand names. At another point in the memorial park you can see a stone monument commemorating the loss of an American submarine during the war. All the names of its crew are engraved on the monument. One thing stood out as we viewed all those names: a number of them were obviously German, and a few appeared to be anglicized German names. It is really a small world, even a long way from Dresden.